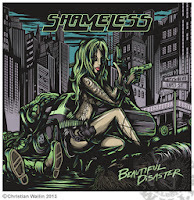 RockUnitedReviews: SHAMELESS - "Beautiful Disaster"
German sleaze merchants Shameless return with their sixth album, reinforcing their solid reputation for classy gutter rock (if that's possible) and as many guests as David Letterman. In fairness, the main guests are rather regular vocalist Steve Summers and Runaways legend Cherie Curie, who pops up on a couple of tracks. 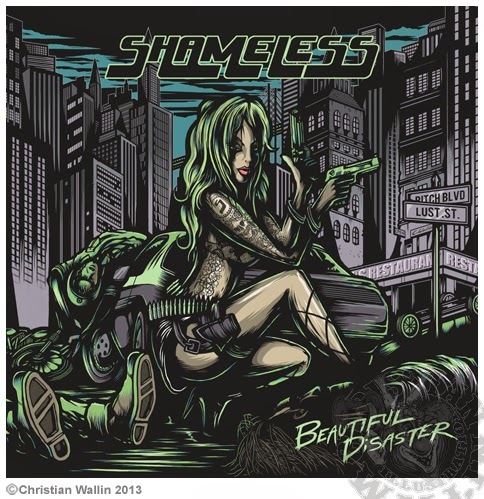 I think the last Shameless album that came my way was "Queen 4 A Day", thirteen odd years ago, and as I remember I liked it, and it's nice to see that several albums later Shameless are still managing to pump out solid, entertaining sleazy rock. There's certainly an Alice Cooper vibe fro this particular disc, from the pounding "Train To Hell" to a faithful cover of "I'm Eighteen", and you cab throw in to the pot a slice of Skid Row and every good time glam band you've ever heard of. Cherie Curies sounds great on "Dear Mum", a jaunty, upbeat piece that can only have taken her back a few decades to her former bands short heyday, whilst Summers nails "I'm Eighteen" with a nasty snarl and duets to great effect with Curie on the slower T-Rex cover "Life's A Gas". Elsewhere, the bands original tracks shine through, full of vim and vigor, with the barnstorming "Greed Is God" kicking off the album with a bang. The energy and quality is held right through to closer "Rock n Roll Girls", which has an usurprising rock and roll flavour to it. All in all, "Beautiful Disaster" is anything but. High energy sleaze rock with enough diversity to stand out from the crowd, this is a throwback that makes the listener want to live back in 1989 when this sort of thing would have garnered praise, fame and chicks by the bucketload. Almost impossible to dislike, Shameless have once again delivered the goods.